Suspended California state Sen. Leland Yee could face a jury as early as June for charges of political corruption and conspiracy to import guns. At a scheduling conference on Thursday, U.S. District Judge Charles Breyer said Yee will be tried along with his political consultant Keith Jackson, who also faces drug and murder-for-hire charges. Breyer said those charges will be tried separately, but lawyers for the defendants, including Yee’s lawyer James Lassart, were not satisfied. 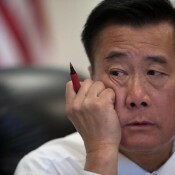 The government’s indictment claims that Yee, who sought to retire debt from his failed 2011 San Francisco mayoral bid and raise money for his subsequent Secretary of State campaign, agreed to vote on certain legislation, help phony companies get state grants and contracts, and offered to import guns from a suspected terrorist group in the Philippines in exchange for campaign donations. Jackson is accused of arranging the meetings and soliciting the donations. Yee and Jackson have pleaded not guilty. Both were arrested during an FBI raid in March 2013. The raid also ensnared Jackson’s son Brandon and sports agent Marlon Sullivan, who are charged with narcotics conspiracy, murder for hire and unlicensed firearms dealing. Breyer said they will be tried with the elder Jackson and Yee, but only on the weapons charge. Two dozen other defendants, including marquee defendant Raymond “Shrimp Boy” Chow, leader of the Chinese American fraternal organization Chee Kung Tong, are still awaiting trial. But Breyer has been adamant from the outset about breaking case into manageable parts. “I can’t have 28 defendants. This isn’t Nuremberg,” he said Thursday. Brandon Jackson’s lawyer Tony Tamburello also protested. James Brosnahan, lawyer for Keith Jackson, also said the political corruption charges should be tried separately. “You said a jury might think this isn’t really criminal. Well this is a great country and they should have that chance. They shouldn’t have guns in front of them. You have a right to make political contributions and petition your government. That’s your right. That deserves separate attention by this court,” Brosnahan told Breyer. But the judge held fast to his plan, again noting that he had already separated out the narcotics and murder for hire charges, in which Yee had no evidentiary involvement. Jury selection will begin on June 1, but the trial will not start before June 22, he said.